Bu araştırmada, eğitim fakültelerinde ders kitabı olarak okutulmak üzere 2009-2014 yılları arasında, Öğretim İlke ve Yöntemleri, Eğitim Bilimine Giriş, Türk Eğitim Sistemi ve Okul Yönetimi ve Sınıf Yönetimi adı altında basımı yapılan kitaplar, yayınevleri, yazar profili ve akademik unvanı, yazar özgeçmişi, iletişim bilgisi ve Yükseköğretim Kurulu (YÖK) içerikleri açısından incelenmiş ve akademisyenlerin kitaplara ilişkin görüşleri değerlendirilmiştir. Bu bağlamda 111 kitap incelenmiş, ayrıca araştırma grubunu oluşturan sekiz farklı üniversiteden 13 akademisyenin görüşleri alınmıştır. Veriler doküman incelemesi ve görüşmeler aracılığı ile toplanmış, doküman analizi ve betimsel analiz yoluyla çözümlenmiştir. Araştırma sonucunda; incelenen kitaplarda akademik ve estetik açıdan birçok eksiklik olduğu bulgulanmıştır. 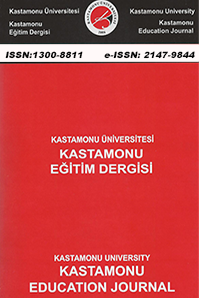 The textbooks entitled Teaching Principals and Methods, Introduction to Educational Sciences, Turkish Educational System and School Management, Classroom Management, published between 2009-2014 to be used in the faculties of education were examined in terms of publishers, authors’ profile, academic title, bibliography, contact information, and standardized contents by YOK; the views of academics were evaluated. 111 books were considered and the perceptions of 13 academics from 8 different universities were received. The data collected through book reviews and interviews were analyzed through document and descriptive analyses. Findings indicate the books examined in this study lack academic and esthetic quality in many ways. Amiryousefia, M.; Ketabib, S. (2011). Anti-textbook arguments revisited: a case study from Iran. Procedia - Social and Behavioral Sciences, 15, 215-220, Doi:10.1016/J.Sbspro.2011.03.076. Amiryousefia, M.; Zareib, G.R. (2011). Are MI and Motivation Catered for in EAP Textbooks?, Procedia - Social and Behavioral Sciences 30, 573 - 577. Coşkun, R. (2011). “Yönetim‐Organizasyon” ders kitaplarında biçim ve ideoloji. Eskişehir Osman- gazi Üniversitesi İ.İ.B.F. Dergisi, 4 (1), 239-258. Fadulto, V. R. (2008). A content analysis of contemporary college algebra textbooks: Applications of visualization strategies. Unpublished Doctoral Thesis. Harwood, N. (2005). What do we want EAP teaching materials for?. Journal of English for Acade- mic Purposes, 4, 149–161. Heyneman, S.P. (2006). “The Role of Textbooks in a Modern System of Education.” In Bralavsky, Cecilia, ed. Textbooks and the quality learning for all: Some lessons learned from ınternational experience. Geneva: International Bureau of Education, 2006. 31-93. Kiewra, K. A., & Gubbels, P. S. (1997). Are educational psychology courses educationally and psycho- logically sound? What textbooks and teachers say. Educational Psychology Review, 9, 121–149. Okamoto, K. (2013). Making higher education more affordable, One course reading at a time: Aca- demic libraries as key advocates for open access textbooks and educational resources. Public Services Quarterly, 9(4), 267-283, Doi: 10.1080/15228959.2013.842397. Ormrod, J.E. (2006). Commentary: Similarities and differences among educational psychology textbooks: An author’s perspective. Teaching Educational Psychology, Vol. 1(3), 1-4. Petrides,L., Jimes, C., Middleton-Detzner, C., Julie Walling, J. & Weiss Open, S. (2011). Textbook adoption and use: implications for teachers and learners. Open Learning, 26(1), 1, 39–49. Richardson, P.W. (2004). Reading and writing from textbooks in higher education: a case study from Economics. Studies in Higher Education, 29 (4), 505-521. Searle, B. W., Mertaugh, M., Real, A. & Cohen, P. (1988). Improving the Quality of Textbooks in China. World Bank Discussion Papers 30. Seguin, R. (1989). The Elaboration of Schooltextbooks Methodological Guide. Division of Educa- tional Sciences, Contents and Methods of Education, UNESCO. Seifert, K. (2008). Purchasing Networks as Clues to Assessing Educational Psychology Textbooks. Teaching Educational Psychology, 3(1), 1-4. Wright, R.A. (1995). Was there a “golden past” for the ıntroductory sociology textbook? A citation analysis of leading journals. The American Sociologist, 26(4), 41-48. A textbook case for writing one (http://www.timeshighereducation.co.uk/news/a-textbook-case-for- writing-one/310670.article)(5.10.2007)(01.09.201), erişim tarihi, 05.01.2015. ISNAD GÖK, Enes , İPEK, Cemalettin , YAYLACI, Ali Faruk , BELDAĞ, Adem . "Yükseköğretim Ders Kitaplarında Nitelik: Eğitim Bilimleri Alanındaki Kitaplara İlişkin Bir İnceleme". Kastamonu Eğitim Dergisi 24 / 3 (July 2016): 1245-1262.